§ 5. ABOUT the time of the above-named persecution, an intolerable affliction arose of a sudden in Northumberland, and grievously shook the churches of God therein. At that time, a certain man of great talents, named Eardulf, was ruling, in a praiseworthy manner before God and man, the bishopric of the church of Lindisfarne, in which rested the body of God’s most holy confessor, St. Cuthbert. This man, remembering the last admonitions which that holy father had given his brethren, as he was at the point of death, chose to vacate his place rather than be in subjection to the wicked. For, among other precepts of love and peace which his paternal affection had dictated, Cuthbert had thus warned them:—“If you are ever obliged by necessity to choose between the two, I would much rather that you should remove my bones from the tomb, and taking them with you leave this place, and stop where God shall determine, than that you in any way be consenting to iniquity, and submit your necks to the yoke of schismatics.” There was at that time, also, a certain abbot, Eared by name, of wonderful sanctity before God, and of no little nobility among men, who had always as much devotion towards God’s holy confessor as the bishop himself. When, therefore, this tribulation was afflicting them, these two men, taking with them some others of a religious character, carried away the incorruptible body of the venerable father from the monastery of Lindisfarne. When his own people heard of this, they left their houses and household goods, and immediately followed him, with their wives and children. For they who are properly called his own people, inasmuch as they are kept by him in especial protection, and cannot live anywhere else save under him, as some nations, which can live as well in foreign lands as their own; these, I say, have so much security from his safeguard, that they fear hardly any injury from adversity. Now his having so often piously saved from their adversaries those who took refuge with him, whereof we shall speak further hereafter, must by no means be referred to their own merits, since all, save a very few, have done evil; but yet the question, how much firmness of faith may be of avail, is a question for the consideration of every one. § 6. Now it happened by God’s providence they traversed nearly the whole land, carrying with them the precious body of the holy confessor. But the bishop and the abbot, being at length overcome by the fatigue of this constant toil, deliberated for a long time between themselves, whether they should seek a termination to their labours, and a rest for the saint’s corpse in Ireland, particularly as they saw no hope of remaining in any part of their own country. Wherefore they called together the others who were wiser and older than themselves, and the plan obtained the approbation of all of them. 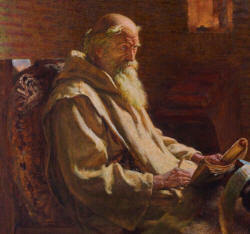 “It is evident,” said they, “that we are advised to seek a place of repose in a foreign land; for, if such had not been the will of God, and of the saint himself, we should long ago have had a proper place provided for his own sanctity, and for ourselves.” Such were their words; but the incomprehensible wisdom of God disposed it otherwise. For when they had come together at the mouth of the river Dyrwent, because the passage to Ireland was easiest and shortest from thence, a vessel was got ready, the holy body was placed on board, the bishop and abbot embarked, together with a few who had been made acquainted with the undertaking, whilst all the others were ignorant of the reason of the voyage. But why do I multiply words? They bade farewell to their friends who were on the shore looking on, and spreading their sails before a favourable wind, turned the ship’s head direct for Ireland. What was at that moment, do you suppose, the sorrow of those who remained behind? and what was the lamentation which this sorrow gave birth to? They threw themselves prostrate on the ground, sprinkled their heads with dust, tore their garments, and beat their breasts with stones, and with their fists; and at length broke out altogether into an exclamation of this kind:—“O thou father and patron of ours, how are we abandoned, wretches that we are, as captives to the rage of our enemies, like sheep to be devoured by wolves!” This was all they uttered. § 7. On a sudden the wind changed, the waves rose high, and the sea, which was before tranquil, became dark and stormy; the vessel was tossed this way and that way without guidance, and those who were on board were struck aghast like dead men. Three immense waves, coming one after the other with dreadful sound, almost half filled the vessel; and, by a miracle unheard of since those of Egypt, were immediately changed to blood. This storm forced the ship on its beam-ends; and a copy of the Evangelists, adorned with gold and jewels, fell overboard into the sea. When they had a little recovered their senses, and recollected themselves, who and where they were, they bent their knees, and falling at full length before the feet of the saint, asked pardon for their foolish attempt. They then seized the helm, turned the vessel round to the shore where they had left their friends, and as they then had the wind favourable, they very soon arrived there. Then those who had before wept for sorrow, now wept for joy; but the bishop with his companions, shedding tears for shame and sorrow, prostrated himself on the ground, and earnestly prayed forgiveness of his sins. § 9. In this strait they were at length relieved, both in mind and body, by the aid of their pious patron himself; for the Lord is the refuge of the poor, a very present help in trouble. One of them, Hunred, saw the saint in a vision, and was told by him, that, when the tide was out, they should search for the book, which, as we have already stated, had fallen into the sea, and, perhaps, if God took compassion on them, they might find it, though they could not presume to hope so. For the loss of this book had caused them the greatest anguish of mind. Moreover, he spake these words to him: “As soon as you rise, take a bridle, which you will see hanging on a tree, and hold it up before a horse which you will see not far off, and he will come to you immediately: put on the bridle, and he will draw for you the carriage in which my body is placed, and so you will be relieved from your present labour, and be able to follow it.” As soon as Hunred was awake, he related the vision which he had seen, and immediately sent some of his companions to the shore, which was not far off, to search for the book which they had lost. Now, at this time, they had reached the place called the White House, or more commonly, Huvitern. They went, accordingly, down to the sea, which they found had ebbed much farther than usual; and when they had gone three miles or more, they found the Holy Volume of the Gospels, with its gold gems and all its outward splendour, as well as its letters, and leaves, and all its inward beauty, so sound and perfect, that it looked as if it had not been touched by the water. At this event, their minds, hitherto anxious, were filled by no slight joy; and Hunred, whom I mentioned before, felt no doubt that all the rest would come true also. Wherefore he went and saw the bridle, as he had been told, hanging on a tree; and then looking on all sides round him, he saw a horse, of a chestnut colour, a little farther off, though it was impossible to say how or whence he could have come into such a desert place. As soon as the man held up the bridle, the horse ran up to him and offered himself to be bridled. Hunred led him off to his companions, who now were the more encouraged to toil in the cause of the holy saint’s body, inasmuch as they saw that his aid would never fail them. Therefore they harnessed the horse to the cart, on which was placed the corpse in a chest, and followed it fearlessly everywhere, as they knew that they now had a horse provided for them by God. Moreover, the book aforesaid is still kept to this day in the church, which has been thought worthy to contain the body of the holy saint; and, as I said before, it bears no mark of having been injured by the sea-water. This was no doubt brought about by the merits of St. Cuthbert himself, and of the authors of the book, namely, Bishop Eadfrid of blessed memory, who wrote it with his own hand in honour of the blessed Cuthbert, and his successor, the venerable Æthilwald, who had caused it to be adorned with gold and jewels; also of the hermit Bilfrid, whose skill in workmanship equalling the intentions of the designer, had executed the splendid work, for he was one of the first artists of his day. These three, burning with zeal towards God’s beloved confessor and bishop, left this as a memorial of their devotion towards him to all posterity.